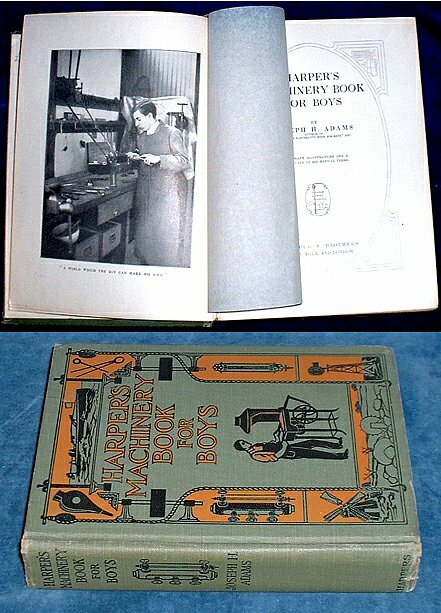 Title: HARPER'S MACHINERY BOOK FOR BOYS with many illustrations and a dictionary of mechanical terms. Description: New York & London, Harper & Brothers 1909 Frontispiece + many text illustrations & diagrams. . Octavo pictorial cloth (tips rubbed) xiii + 372pp lacks free endpaper, inner hinges loose else clean & crisp. Deals with water- wind- steam & electrical power, foundry work wood- metal & stone- work as well as cars, boats etc.